My Youview app is paired to a T2100 & the TalkTalk app is paired to a T4000. Both have lost visibility of much of the schedule on these boxes independently. Both apps are upto date. Looks like a cloud issue perhaps? 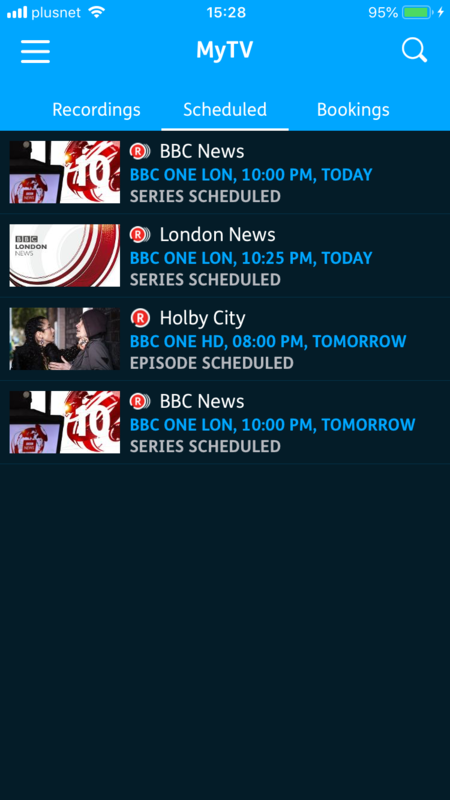 On my iOS YouView app, the usual three programmes for today, and then nothing. Box-style, where you only get the next showing, instead of the greatly to be preferred 7 days to come that the app used to show. Though as we have no later one-offs set, I don’t know if it is cutting off after today, or cutting off after one next showing, or what. Does what you can see, @Tim C, support either hypothesis? I do hope this is a temporary glitch. There's no definable logic that I can see to what's missing. Nothing after tomorrow but there's is missing stuff tomorrow as well like The Great British Sewing Bee. I just set a program to record via the app & another via the box (both for today) & they are both picked up by the app. Just done the same for Thursday & again the app can see them, but not those already there for Wednesday or Thursday. Same here. Looks like it missed a couple of days in this week’s bookings. 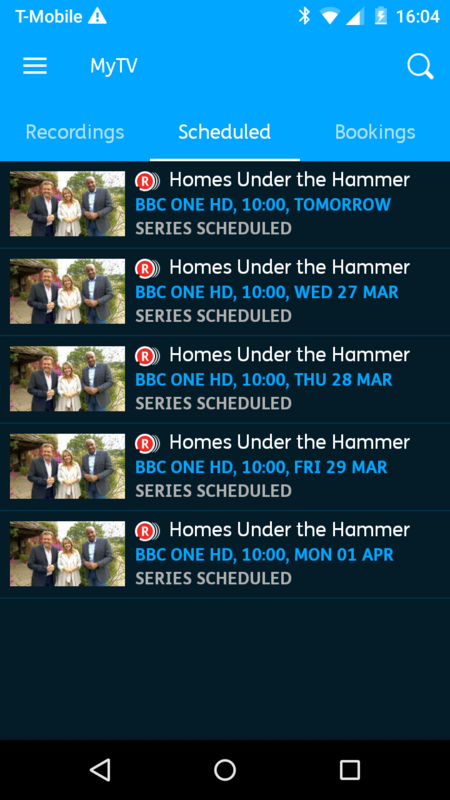 Note that Homes Under the Hammer, a regular staple, is missing now, and looking at the Guide, the programme is there for tomorrow and subsequent days, but the recording flag is not. Oops. 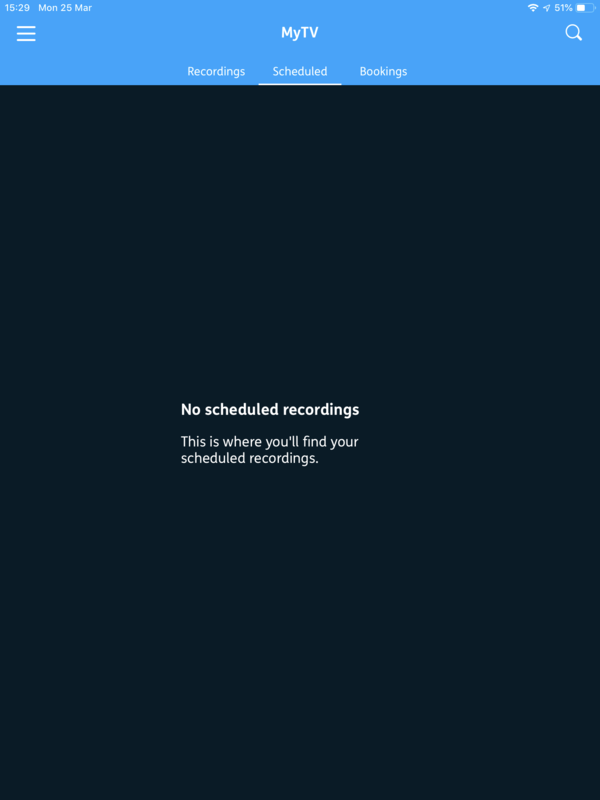 There were three recordings scheduled, all for today, including HUTH, when I checked earlier, and all have recorded OK, which is why the schedule now shows empty. (Even though it shouldn’t, if you see what I mean). The schedule on my Android phone is complete, except that all the thumbnails are gone. And it also accurately shows that HUTH has gone, which may be completely unrelated, or it may be a part of this. All these bookings were made yonks ago, and usually from the app on iPad or Android phone, but both now say No Bookings To Display. All these booking are Series. Both devices are paired with the T2000. I put HUTH back with Series Schedule on the T2000. It reappeared in Schedule on the box. And this week’s episodes instantly populated Scheduled on the iPad, but everything else is still missing. On the Android phone, HUTH likewise reappeared, but the thumbnails for all the other Scheduled programmes remained gone, and only HUTH has them. Stop press: actually while I was looking at it, all the other programmes disappeared off the Android phone as well, leaving only the grin HUTH, still with thumbnails. Thanks for the screenshots @Roy. Our team are continuing to look into this after reproducing this on a few different devices on our end as well. We will let you know when we get any further updates. Here's mine from the Youview iOS app and the T2100. As a test I paired another iOS device to the T2100 and exactly the same items are missing from the schedule. Looks like it’s fixed, on both my iPad and my Android phone. Not on my iPhone unfortunately. It;s only picking up new recordings eg the next series recording after the scheduled one has ocurred. Hopefully we will get an explanation , unlike the failed recordings fiasco of last year. (i) HUTH is not there for next Tuesday 2nd April, though Doctors and Countdown, both later on that day, are present. HUTH is also missing from the Guide on the app. (ii) Nothing is scheduled for 3rd April, on either Schedule or Guide. 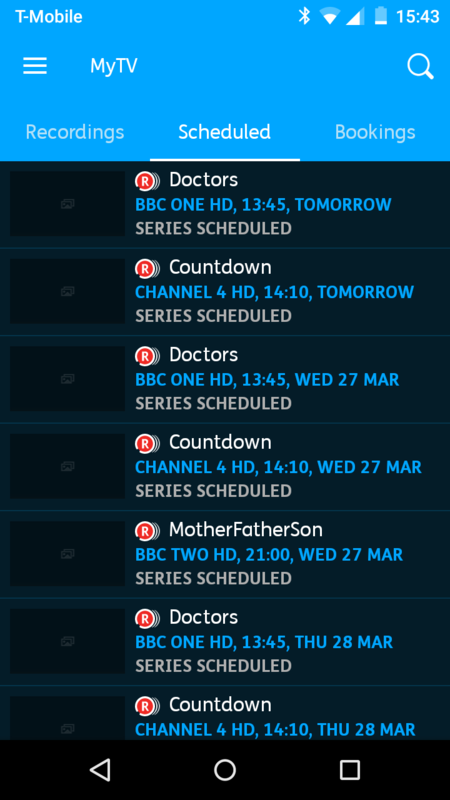 On the paired T2000 box itself, all these programmes are present, right up and including the 3rd April, except that HUTH (Series Recording on BBC1 HD) is not present for April 2nd, though it is there for the 1st and the 3rd. 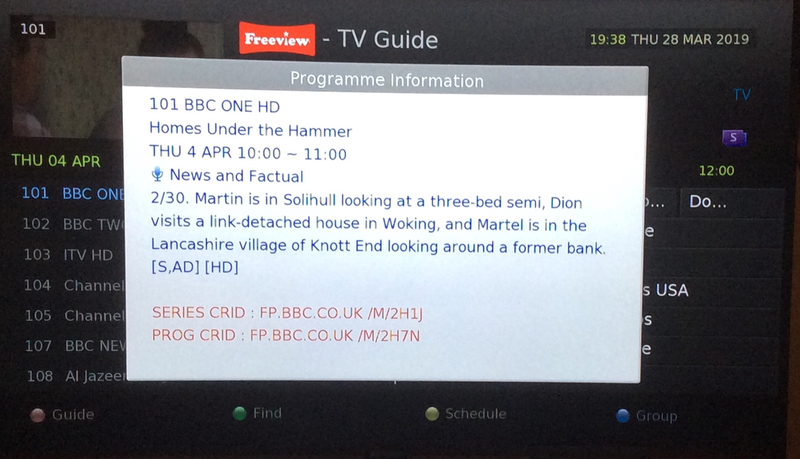 According to Freeview (the app, not the web page, according to which there is practically nothing on TV next week at all) HUTH is scheduled as normal by the BBC at 10:00 on 2nd April. We've put together some information below to explain some detail behind the issue of the failed recordings. Thanks again to everyone who has contributed some information or data to help us when we were investigating, it's been very much appreciated. Programmes and the accompanying data that describes them (what the next programme is, programme description etc) are batched up and broadcast in different ‘streams’, so some of the BBC channels are in one stream, ITV channels in another etc. To make sure each stream knows about the others, some of the accompanying data, particularly information about what programme is now being broadcast and what comes next is sent on all streams. This information is re-sent at regular intervals. In this case the information about what is happening on other streams started taking longer to arrive and was timing out when being processed. 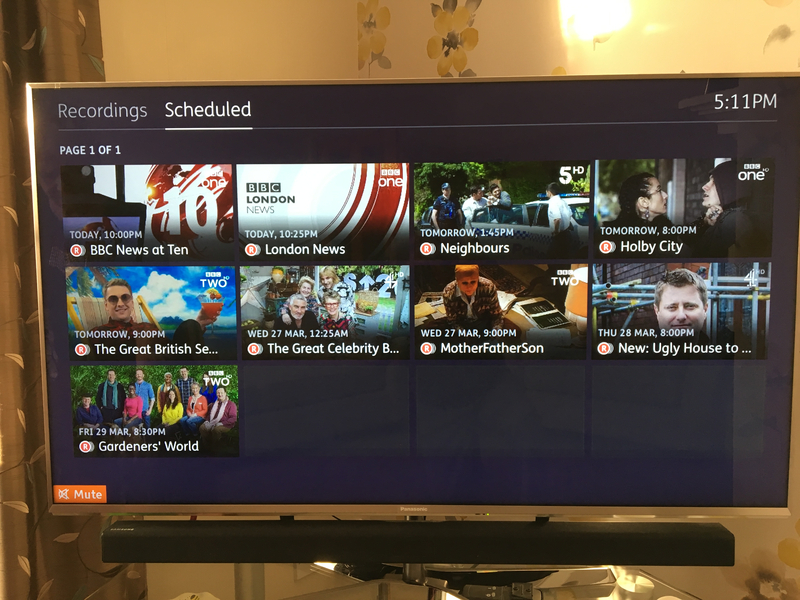 This led to the Humax layer thinking the information on other streams was invalid and stopped processing it. Therefore, if this time out happened, if you were tuned to a channel on one stream and a recording was due to start on another stream, the current stream wouldn’t know about the programme due to start and wouldn’t give the instruction to make the recording happen. 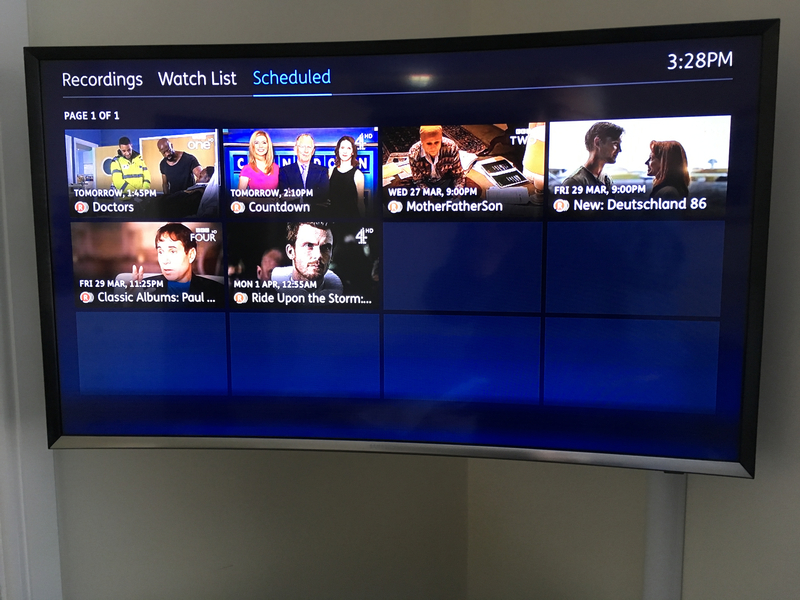 A change has been in the Humax layer to make sure that it handles the time out processing better – and continues to process the ‘other stream’ information. This is going through testing and we aiming to roll out as soon as possible. The point I was making was that somewhere , someone made a change that caused this incident. It didn't just happen. It was never identified where that change was made or by who and by who I mean which organisation. It was clearly in the stream of data from Youview's servers as units not connected to the internet appeared to be unaffected. Everything back to normal on my iPhone apps for both my units. It very likely did ‘just happen’. The information in question is broadcast, not internet-delivered, as metadata in the broadcast stream, and is used for the timing of recordings on channels you aren’t actually tuned to. 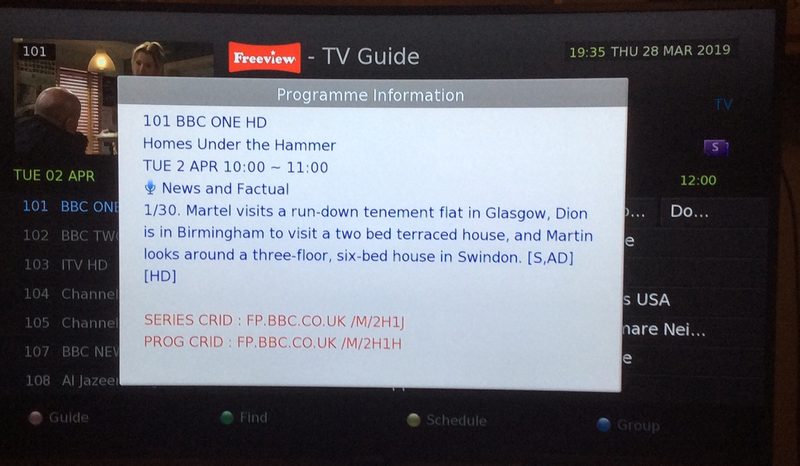 e.g., if you are tuned to BBC2 HD, say, and you have a programme scheduled to record on the Smithsonian channel, then the Present/Following data marker that indicates the transition from one programme on the Smithsonian channel to the next must also be sent out on the BBC2 metadata stream, or boxes that use AR won’t know to fire up the second tuner to get it. As more and more channels are added to Freeview - of which Smithsonian is a recent example - the amount of data about ‘other’ channels in that metadata stream grows, and takes longer and longer to transmit, and the Humax boxes weren’t allowing long enough for one full cycle any more. But what ‘units not connected to the internet’ are you thinking of that were unaffected by this? Do any of them actually use Present/Following? It does seem though, that makers other than Humax were unaffected - Hauwei YouView boxes, Freeview Play recorders made by Panasonic, and so on. I wonder if Humax Freeview Play recorders were similarly affected? If not, I expect they all had longer guard times when accepting ‘other’ programmes metadata, something that has now been applied to the Humax YouView boxes. Not every problem on a box is down to someone changing something on the box - sometimes the change is in the environment the box operates in, and that breaks something, especially windows of opportunity that gradually become too small. Just revisited this thread. All normal again here too. “Shut happens, back soon” (as it said on the door of a cupcake shop in Brighton one night after they were closed). A bit like this YouView experience, I suppose. When I referred to "other units not connected to the internet" I was referring to Humax Youview boxes. At the time the Youvew box not being internet connected seemed to be a solution , likewise "always on" had a positive effect. Thanks Louise - but what was it? I would also like to mention that besides losing Homes Under the Hammer on the T2000, it also vanished from the T4000, and it is not just that it is scheduled but doesn’t show, it has actually stopped recording, and has been missing since Tuesday, until I put it back from tomorrow. Is this related to the above, or a separate issue? Can you ask the BBC if they started a whole new Series CRID for HUTH last Tuesday? I also note that although I put the Series recording of HUTH back last week, it is there April 1, missing April 2, there April 3, and missing April 4, which is as far as things go at present. That is, missing both from the Schedule and from the Guide on the app. 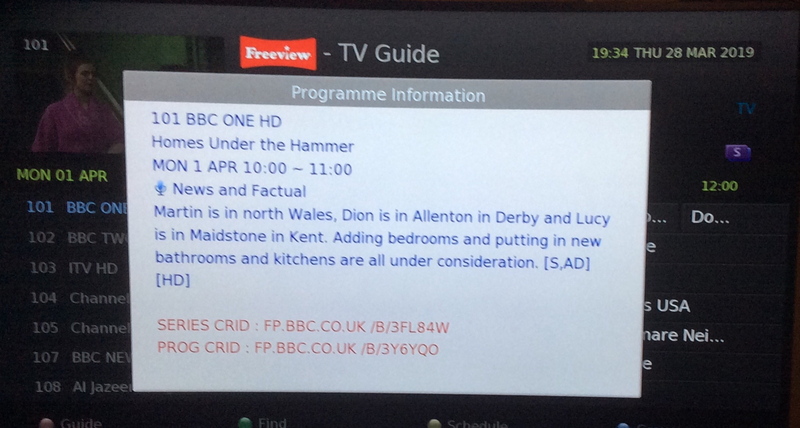 @Roy the BBC do seem by intention or error to be broadcasting on Freeview more than one series of HUTH. We really do need the YouView box to show CRIDs, don’t we? I wonder if some kind soul could implement this for us? But thanks, @zulu17, what you report exactly agrees with me having set a Series record for 3FL84W only. So I will try a Series record from Tuesday 2nd, and that should get the 2H1J series as well. Theres been no public comment on this by the BBC. 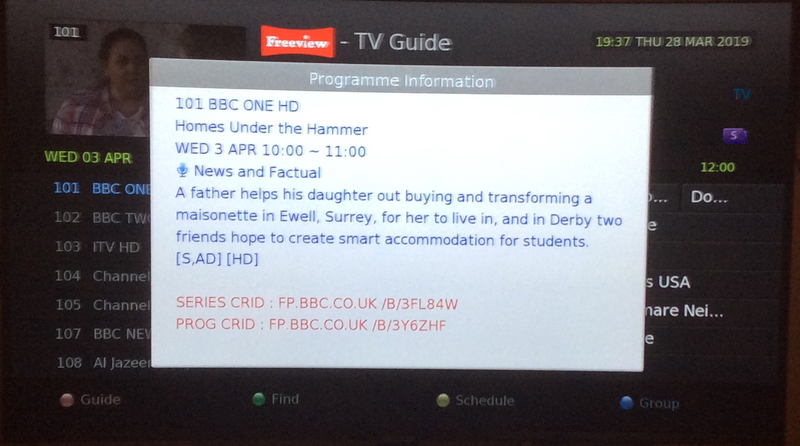 But its believed the previous EPG incumbent Red Bee had their contract cancelled by the BBC and they moved it in-house. Which caused chaos on every platform out there. Satellite, DTT, Cable and third party online players. It may also explain why YouViews apps went haywire as well (or may not).